In my young years for all I knew, soup grew in a can. At least all soup reaching our dining table came OUT of a can. Most of it was borderline nasty, except for cream of asparagus. For some reason we rarely had that soup, so it naturally became a rare treat. Fast-forward more decades than I care to count…to the other day. Some lovely fresh asparagus winked at me from the produce aisle. The local harvest is just beginning. I picked up a little bundle, despite the high price, and brought it home. I did, just a few hours ago. It’s richer and more dressed up than the soup I had as a kid. 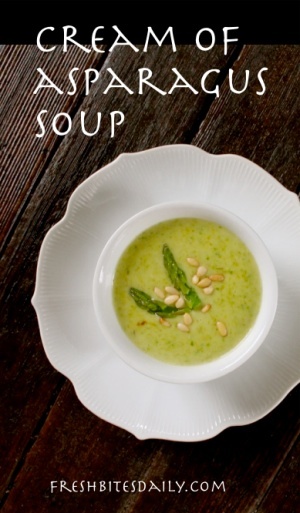 This is a grownup cream of asparagus soup. The next question was whether 5-year-old Alastair would enjoy a grownup soup. He slurped his way through a bowl of it, all the while making approving little sounds. The sound effects tickled us to the point that his Mama taped some of them with her iPhone. Success! 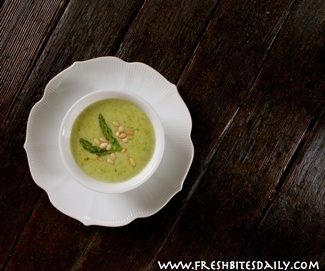 Below you will find the recipe for a grownup cream of asparagus soup that comes with a 5-year-old’s seal of approval. The large soup conglomerates will be dying of envy! Working with one stalk at a time, break off the tough ends. If you grasp 2/3 of the stalk from the flowering end in one hand and bend the fatter end of the stalk with your other hand, the tough part of the stalk with break off. Cut off the top 2 inches of the stalks and set the tops aside. Cut the rest of the stalk into 1 inch pieces. Melt the butter in small soup pan. When the butter begins to bubble, add the minced garlic. Stir for about 30 seconds. Add the one inch pieces of asparagus stalk and stir. Pour in the chicken broth and cover with a tight-fitting lid. Cook the asparagus over medium heat until the pieces are tender. Add the asparagus tops and cook for about a minute until the tops turn bright green. Remove the tops and set aside for garnish. Pour the cooked asparagus and broth into a food processor and puree. Return the puree to the soup pot, still over medium heat. Mix the thickener with the whipping cream and wine. 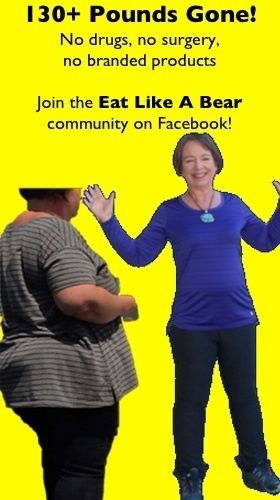 Make certain to have no lumps. Slowly pour this mixture into the soup, stirring the whole time. Cook for 2 to 3 minutes as the soup thickens up and the alcohol cooks out of the wine. Add salt and taste. Add more salt if need be. Check the consistency. Add more broth to thin it down. Use more thickener for the opposite. Serve the soup into four bowls. Garnish with the asparagus tops and a sprinkling of pine nuts.